The Annual PTA Caucus Meeting held June 23-24, 2018 in Orlando, Florida was well attended Chief Delegate, Amy Smith presided over the meeting. The business agenda included candidate interviews and elections presented by the PTA Caucus Nominating Committee. After an outstanding slate of candidates shared their vision for the PTA representation and ongoing role in our profession, the following were elected to serve: Chief Delegate- David Harris (TN); Alternate Delegate- Drew Wilcox (UT); Nominating Committee- Rachel Winthrop (MN). Jimmy Pacini (CA) was elected in a special election to fulfill the 2-year term vacated by David Harris. The outgoing Chief Delegate, Amy Smith, after 6 years of service, was recognized with great appreciation for her brilliant leadership and many contributions she has provided the PTA Caucus. The 2018 Outstanding Physical Therapist Assistant Award co-recipients recognition and appreciation was shown to Jodi Pfeiffer (AK) and Amy Smith (AL). Continuing to ensure the PTA has opportunity to develop their knowledge and expand skills, many PTA’s are taking the PTA Advanced Proficiency Pathways (APP). This program provides PTAs with clearly defined post-graduation educational curriculum that leads to advanced proficiency. This year many of our colleagues completed the program and were also recognized by the PTA Caucus for their continued success in academic excellence. The PTA Caucus is joining in one of four groups to discuss how to better our partnerships with APTA’s Education Leadership Partnership (ELP), building a stronger PTA community through communication, plans for celebrating the 50th anniversary of the PTA in 2019, and fostering leadership growth within the PTA Caucus. 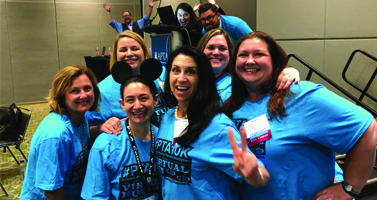 Lastly, a newly launched membership initiative to reach 10,000 PTA members was brought back to Chapter Leadership in an effort to initiate plans to increase PTA membership. Pictured above: Lisa Zemaitis, IL PTA Director with fellow PTAs wearing their #PTA10K shirts. I encourage each of you to take a moment to write down your thoughts on where you would like to see the future of the PTA profession. Are you interested in becoming involved in leadership? How can we further our efforts in the PT/PTA Team? Our communities? Please feel free to share your questions; ideas and thoughts with me so I can better serve you. Membership matters…#PTA10K Be a part of the movement!